The dream of a perfect outdoor space where homeowners can enjoy the beauty of nature while still being completely comfortable is no longer limited to a specific climate or time of year. A one-of-a-kind, all-seasons deck is possible if the right features are included in the design. The key is to combine features that protect from the elements, and then use the right materials to make it happen. Whether you’re revamping an existing area, or creating a brand-new outdoor living space to enjoy all year long, the following deck additions can turn any project into an all-seasons oasis to enjoy with family and friends. Overhead covering on a deck can shield guests from the elements directly, as well as provide a scaffold for features such as a ceiling fan, which can cool the area in the warmer months and improve heated air flow during cooler months. Homeowners can choose from deck shades or awnings in a variety of materials to defend against rain and wind, or to reduce sun exposure and cool the area. A pergola is also a beautiful addition to a custom deck that doesn’t provide full coverage like a roof or awning, but can serve as a solid framework for other features such as climbing vines or hanging plants that both provide cover and add ambiance to the outdoor oasis. Retractable walls are a high-tech option that allows for free air movement during the mild spring and fall, and protection from sun, wind, rain, snow and even bugs during the extreme summer and winter. Some luxury decks and patios utilize retractable glass walls for a defense against wind or rain that doesn’t obstruct the view. A more common tactic is to install retractable screen walls, which can be motorized, and are meant primarily to keep insects out of the patio area. Retractable privacy walls, usually in the form of canvas or polyester fabric horizontal shades, can provide a respite from weather and enhance the feeling of a private sanctuary. Beautiful low-maintenance materials are a must for any outdoor living space that homeowners would like to spend time enjoying, rather than performing backbreaking annual maintenance. Taking care of traditional wood decking can be a difficult and frustrating process since it is subject to staining and splintering, and may require annual sanding and painting. 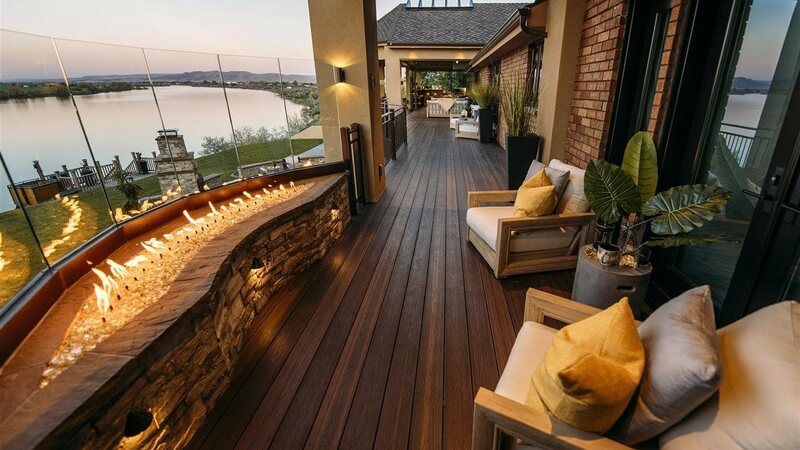 Composite decking is growing in popularity across the U.S. not only for its lower maintenance requirements, but also its unparalleled beauty that can emulate anything from the rustic beauty of reclaimed wood to the high-impact look of exotic hardwoods. Incorporate the elements into the deck in a controlled way to boost enjoyment of an outdoor living space regardless of the season. 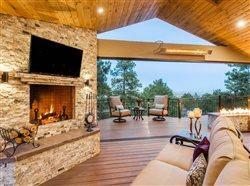 For colder months, adding a fire element can provide a cozy and mesmerizing focal point. Arranging comfortable seating around a fireplace or fire pit provides a great place to gather with friends and family and provide warmth on a cool summer night or fall weekend. 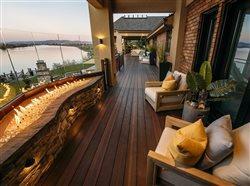 During the hotter months, installing a water element to the deck can provide a cooling touch and a visual centerpiece. Fountains, misters, or even a lap pool can provide a welcome respite from the heat during the summer, and a soothing, meditative backdrop for the rest of the year. Although decks are generally a mild-weather attraction, there are many ways to make an outdoor living space functional and enjoyable during the rest of the year, regardless of the geographic location. Transform a deck into an all-seasons sanctuary through the use of special features and beautiful low-maintenance composite decking to make the most of the beauty of the outdoors without sacrificing the comfort and style of your unique outdoor retreat.